Cliff Bleszinski, creator of the Gears of War series, and his team are working hard to tweak their next game, LawBreakers, for release. Starting tomorrow, a new closed beta will launch on PC and select GeForce Experience members will be able to take part in it. Codes for the next LawBreakers closed beta, which will begin tomorrow June 28th and end on July 3rd, will be sent to 20.000 GeForce Experience members today. Winners will be notified by the GeForce Experience client if the communications from NVIDIA are allowed. 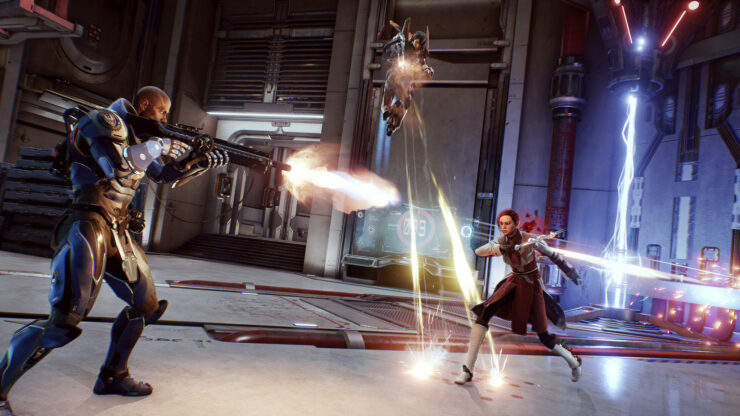 LawBreakers promises to set itself apart from other similar games thanks to its gravity-defying combat, different antiheroes whose skills will take advantage of the combat mechanics, unique maps and play modes. Choose your role from a cast of unique characters, each equipped with distinct movement skills, battle abilities and weapon combos. Fight in dynamic gravity ravaged arenas that offer players a breathtaking vertical team-based battle royal. Revel in unparalleled vertical violence by mastering the skills of an array of diverse antiheroes. Whether you kill to uphold the “Law,” or are out for blood as a “Breaker,” these symmetrical roles satisfy any appetite in an arena where the most skilled player and team will rise. Experience a futuristic America, years after a global seismic event known as “The Shattering” forever changed the landscape and even gravity itself. Become immersed into a raging conflict between Law and Breakers across nearly unrecognizable locations ranging from a futuristic Santa Monica to a re-imagined Grand Canyon. Fight to the death in intense game modes that elevate the competitive shooter genre to all new levels. LawBreakers’ signature brand of gravity-induced chaos, combined with innovative takes on multiplayer game modes, offers a truly unique and exhilarating experience. LawBreakers launches on August 8th on PC and PlayStation 4.